About Us - GreensPlease. Whole Food Green Smoothies. 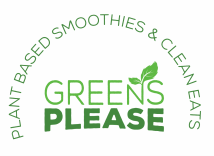 Deliciously blended whole food smoothies and healthy eats made from all natural and organic ingredients. All our blends include at least 6 types of greens, chia seed, flax seed, kelp and alkalized water. We call this list our DARK LEAFY GREENS. Each sip has an abundance of antioxidants, nutrients, and delightfulness! Plus, the medley of organic seasonal greens ensures you get a wide spectrum of vitamins and minerals. Nearly all vegetarian and omnivorous animals, as well as our hunter/gatherer ancestors' diets change with seasons. We strive to source most of our produce from local San Diego farmers and blend each smoothie with the utmost thought in nutrition and taste.